Winnie the Pooh is standing to the right of the bass (search: cello), playing it with a bow. 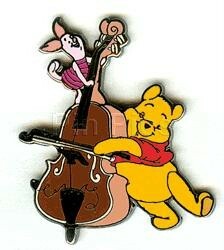 Piglet is standing on top of the body of the bass holding the strings, helping Pooh play. size 1 ' inches high x 1 inch wide.